The share of Americans whose primary religious affiliation is Catholic has fallen somewhat in recent years, and now stands at about one-in-five. But according to a new Pew Research Center survey of U.S. Catholics and others, an additional one-in-ten American adults (9%) consider themselves Catholic or partially Catholic in other ways, even though they do not self-identify as Catholic on the basis of religion. 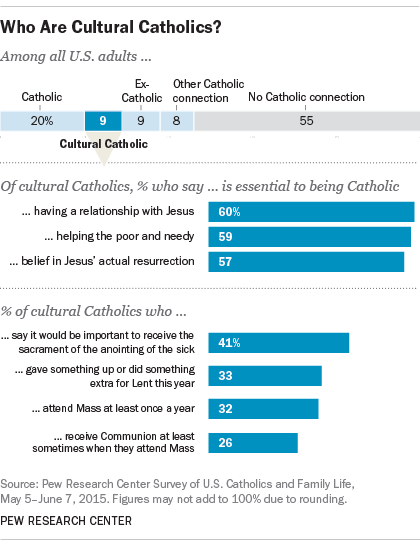 Most of these cultural Catholics (62%) say that for them personally, being Catholic is mainly a matter of ancestry and/or culture (rather than religion). But majorities also point to religious beliefs and teachings as key parts of their Catholic identity. For example, 60% of cultural Catholics say that having a personal relationship with Jesus Christ is essential to what being Catholic means to them. Likewise, 57% say the same about believing in Jesus’ resurrection. A similar share (59%) say that working to help the poor and needy is essential to their Catholicism. Sizable minorities of cultural Catholics also participate in some of the church’s rituals. For instance, about a third of cultural Catholics (32%) say they attend Mass at least once a year, and roughly a quarter (26%) say they receive Holy Communion at least sometimes when they attend Mass. A third (33%) say they gave something up or did something extra for Lent this year, and about four-in-ten (41%) say it would be important to them to receive the sacrament of the anointing of the sick (sometimes part of “last rites”) if they were seriously ill. Roughly two-thirds of cultural Catholics (65%) were raised Catholic or had at least one Catholic parent. And about six-in-ten (62%) of these cultural Catholics who have immediate family connections to Catholicism say that this family background is the reason for their link to the Catholic faith. Among the cultural Catholics who were not raised Catholic and did not have a Catholic parent, a plurality (36%) say that they have an affinity for the church. And 15% say that a previous or current marriage to a Catholic is the reason they see themselves as having a connection to Catholicism. Cultural Catholics tend to show warm feelings toward the church. For example, nearly three-quarters (73%) expressed a favorable view of Pope Francis when the survey was conducted in May and June, compared with 59% of ex-Catholics (i.e., those who were raised Catholic but no longer identify as Catholic on the basis of religion or in any other way). Some of these cultural Catholics may in the future even return to Catholicism – 43% of cultural Catholics who were raised Catholic say they could see themselves returning to the church someday, while only 8% of ex-Catholics say the same.